foot. 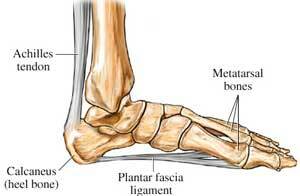 The strongest of these ligaments is the plantar fascia. The plantar fascia takes a lot of the stress when you walk, or even just standing. In some people the plantar fascia becomes painful and inflamed. This usually happens where it is attached to the heel bone, although sometimes it happens in the mid-part of the foot. This condition is called plantar fasciitis. • People who have high-arched (‘cavus’) feet or flat feet are less able to absorb the stress of walking and are at risk of plantar fasciitis. • Reduce the shocks on your heel by choosing footwear with some padding or shock-absorbing material in the heel. Heel pads, bought from chemists, can be put in standard shoes to reduce the impact of walking. • If you have an injury to your ankle or foot, make sure you exercise afterwards to get back as much movement as possible to reduce the stresses on your foot and your heel. If you start to get heel pain, doing the above things may enable the natural healing process to get underway and the pain to improve. Occasionally a bone scan may be used to help spot arthritis or a stress fracture. • Hamstring stretches also help. • Simple painkillers such as paracetamol or antiinflammatory medicines (for example Brufen, Nurofen) can help reduce the pain. Ask advice from your doctor or pharmacist before taking anti-inflammatory medicines as they can have troublesome side-effects in some people. The simple measures above will help the majority of people with heel pain. In fact after about one year 95% of people’s symptoms settle. It is important to be patient, and stick to the treatment programme. If the pain continues, further treatment may be required. • Injection of a steroid (an anti-inflammatory agent) into the attachment of the plantar fascia to damp down the inflammation. The aim of an operation is to release part of the plantar fascia from the heel bone and reduce tension in it. Most people who have an operation are better afterwards. Surgery is between 70% and 90% successful; however, there are risks, including a small number of patients who are worse following surgery. As you will have seen from reading the section above, the pain is not caused by the spur. Rather, both the pain and the spur are caused by inflammation in the plantar fascia. Simple removal of the spur has been shown to be ineffective in relieving the pain since the 1960s.